Assisted by numerous pedagogical aids, A Concise Introduction to Linguistics, 4/e explains all concepts in a systematic way making complex linguistic topics as easy to learn as possible. 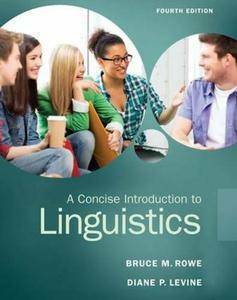 This introductory title covers the core topics of linguistics, providing the information and concepts that will allow students to understand more detailed and advanced treatments of linguistics. This student-friendly and well-balanced overview of the field of introductory linguistics pays special attention to linguistic anthropology and reveals the main contributions of linguistics to the study of human communication and how issues of culture are relevant. Its workbook format contains well-constructed exercises in every chapter that allow students to practice key concepts.